Level Three is the STI Professional Series, ideal for anyone who requires more in depth knowledge of tea production, cupping protocol and flavor profile standards. The student pool has included not only tea professionals from retail and wholesale level, but also importers, growers and researchers. Students from complementary fields such as foodservice, culinary, coffee, wine, pharmaceutical, natural medi-cine/therapy, and international studies have also benefited greatly from this level of hands-on education. 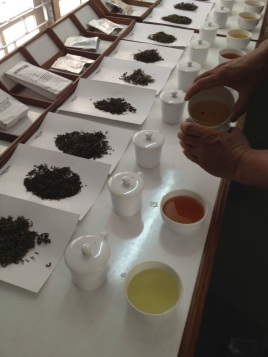 Come prepared to taste lots of tea and join a very diverse tea community! To complete Level Three in its entirety, you must complete all five classes listed below. You do not need to take them in any specific order, but all must be com-pleted and exams passed (where applicable) to receive Certification for Level Three ("Certified Tea Specialist"). Note: After passing each class, you will also receive a certificate for that focused class (example: Certificate for Level Three: Black Teas) to accredit your knowledge in that specific area of tea.